The changing world, on the back of globalization, digital communication and growing emerging economies are providing opportunities to develop advanced materials, whose improved properties can be applied to multiple industries. For instance, the UK is developing low carbon technology to tackle the issue of climate change, thus low carbon vehicles and low impact buildings under development phase that have strong material strand. Innovative advanced material technologies are expected to have a direct and positive impact on economic growth, quality of life and the environment, through improved products and processes. Globally the competition among the players is getting stiff as at any point of time the companies may emerge with the innovative advance material such as gorilla glass in smartphones, composites in Boeing Dreamliner. Healthcare industry, aerospace, packaging, and construction industry are some of the top industries to benefit from the use of advanced material in order to improve productivity, performance, sustainability and regulatory obligations. Goldstein Research analyst forecast that the advanced materials market size is set to reach nearly USD 105 billion by 2025, growing at a CAGR of 10.7% over the forecast period (2017-2025). Structural materials segment acquired the largest market share of 47.7% in 2017 due to the large application of advanced metals, ceramics and composites in the various industries as compared to other types of advanced materials. Based on geography, North America region accounted for the largest market share of 34.1% in 2017 closely followed by Europe due to mammoth manufacturing and construction industry which is shifting their processes towards the use of advanced materials. Asia-Pacific is the next opportunistic region for the growth of advanced materials, expected to grow at a CAGR of 10.8% over the forecast period. The report covers the present ground scenario and the future growth prospects of the advanced materials market for 2017-2025 along with the market players’ analysis. We calculated the market size and revenue share on the basis of revenue generated from major players in the Global region. Global Advanced Materials Market Outlook 2017-2025, has been prepared based on an in-depth market analysis from farm market experts. The report covers the competitive landscape and current position of major players in the Global advanced materials market space. The report also includes Porter's five force model, SWOT analysis, company profiling, business strategies of market players and their business models. “Global Advanced Materials Market Report” also recognizes value chain analysis to understand the cost differentiation, pricing models to provide the competitive advantage to the existing and new entry players. 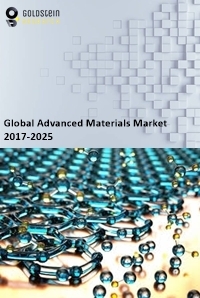 Our Global advanced materials market report comprises of the following companies as the key players: 3M Advanced Materials, Morgan Advanced Materials plc, Pyrogenesis Inc., Huntsman Corporation, Hexcel Corporation, Hanwa Group, Materion Corporation, Cytec Solvay Group, Cnano Technology Ltd., Materion Corporation, etc. The study was conducted using an objective combination of primary and secondary information including inputs from key participants in the advanced material industry. The report contains a comprehensive market and vendor landscape in addition to a SWOT analysis of the key vendors.